The role of educational developer in the realm of service-learning and community engagement (S-LCE) is multidimensional. Given the potentially transformational nature--for both faculty and students--of the experiences and courses in whose design they may be directly or indirectly involved, as well as their responsibility to the communities served by these initiatives, they have to be particularly attentive to issues of identity, values, and roles. As both practitioners and facilitators, they are often positioned as third-space professionals. This edited volume provides educational developers and community engagement professionals an analysis of approaches to faculty development around service-learning and community engagement. 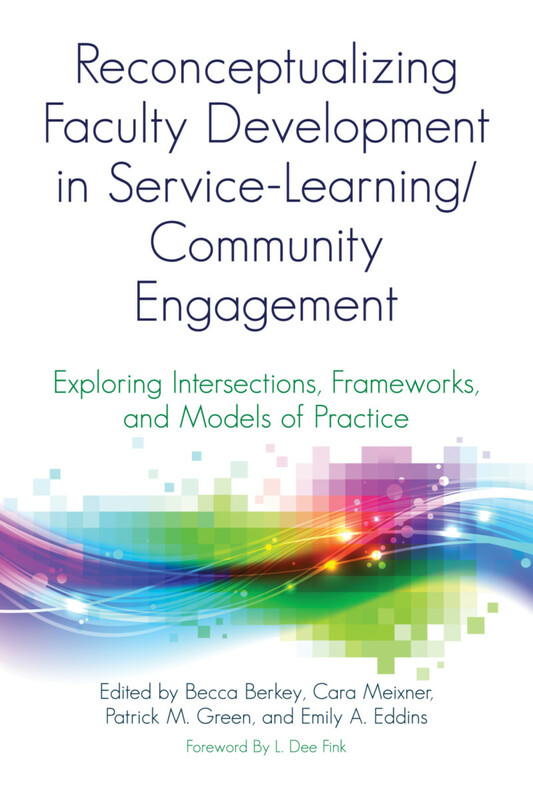 Using an openly self-reflective approach, the contributors to this volume offer an array of examples and models, as well as realistic strategies, to empower readers to evolve their faculty development efforts in service-learning and community engagement on their respective campuses. It is also a call for recognition that the practice of S-LCE needs to be institutionalized and improved. The book further addresses the field’s potential contributions to scholarship, such as the scholarship of teaching and learning (SoTL), publically engaged scholarship, and collaborative inquiry, among others. The case studies provide an outline of program models and promising practices, including an authentic analysis of the institutional context within which they operate, the positionality of the practitioner-scholars overseeing them, the resources required, and the evidence related to both successes and challenges of these approaches. The contributed chapters are organized under four themes: the landscape of faculty development and community engagement; models of faculty development in S-LCE; challenges and opportunities in pedagogy and partnerships; and engendering change in educational development. "Reconceptualizing Faculty Development in Service-Learning/Community Engagement firmly establishes the community engagement field as one that is boundary spanning and inclusive and integrative of multiple stakeholders. Different approaches to the development of faculty, community engagement professionals, and community leaders are highlighted in this text in a useful and accessible format that allows readers to identify lessons, challenges, and new directions for practice. I appreciated the infusion of multiple institution types and the varied resources and strategies that structure educational development for community engaged work.The text invites all of us who care about this work to be attentive to our journeys in the field, reflective about our practice, honest about our shortcomings, and committed to our values.The chapters do a good job of building on and engaging with each other in a way that will make this a valuable and timely resource for the field." "Berkey and colleagues offer an exquisite exploration of faculty development – and the more comprehensive form of educational development – within SLCE initiatives. Beginning with a foundation to the topic that ought to be requisite reading for community engagement professionals, the editors then offer an array of issue-based essays and case studies that present poignant histories, concerns, contexts, and practices of educational development in SLCE. The text is analytically rigorous, conceptually rich, and rife with examples that range from comprehensive initiatives to everyday practices, from resource-intensive to budget neutral. This is a true resource for those of us who work with faculty to advance SLCE on campuses and in communities." Becca Berkey is Director of Service-Learning, Center of Community Service, Northeastern University. Cara Meixner is Executive Director, Center for Faculty Innovation Associate Professor, Graduate Psychology, James Madison University. Patrick M. Green has served as the Director of the Center for Experiential Learning at Loyola University Chicago since its inception in August 2007. The Center for Experiential Learning houses five university-wide programs, including service-learning, academic internships, student employment / community-based federal work study, undergraduate research, and the electronic portfolio program. As a Clinical Instructor of Experiential Learning, Dr. Green teaches a variety of general elective experiential learning courses, engaging students in service-learning, community-based research, internship experiences, and undergraduate research. Dr. Green’s research includes the impact of experiential learning programs on skill development and career development (funded by the National Association of Colleges and Employers Research Foundation Grant), the meaning-making processes of reflection in service-learning/experiential learning, and the use of electronic portfolios in experiential learning (Inter/national Coalition for Electronic Portfolio Research). Dr. Green was chosen as an Engaged Scholar for National Campus Compact, and currently serves on the Board of Directors of the International Association for Research on Service-Learning and Community Engagement (IARSCLE). Emily A. Eddins is Assistant Director, Service-Learning Office of Leadership & Student Involvement, Old Dominion University.